Republican Cindy Hyde-Smith defeated Democrat Mike Espy 53.9%-46.1% with 99.1% of the vote reported in a "racially charged" race hysterical Democrats attempted to make a referendum on lynching due to an out-of-context joke. 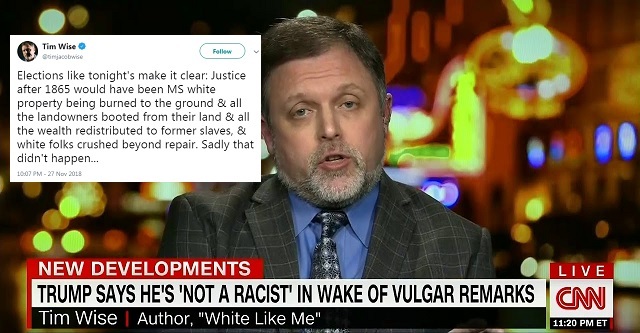 Tim Wise tweeted after the results came out: "Elections like tonight's make it clear: Justice after 1865 would have been MS white property being burned to the ground & all the landowners booted from their land & all the wealth redistributed to former slaves, & white folks crushed beyond repair. Sadly that didn't happen..."
Wise tweeted a little earlier: "As MS shows us, white southerners will vote 4 right wing racist Republicans even while they revere the flag of right wing racist Democrats, bc 2 them it's never been about party...always about race/white supremacy; the North should've burned the South 2 the ground after the war and salted the earth...and I say this as a southerner whose family would have been negatively affected by such a thing...but it would've been inarguably just...we deserved to lose literally everything..."
In the run-up to the 2016 election, Tim Wise told all Trump supporters, "you are my enemy" and said "I will not seek to coexist with you" after they lose the election. 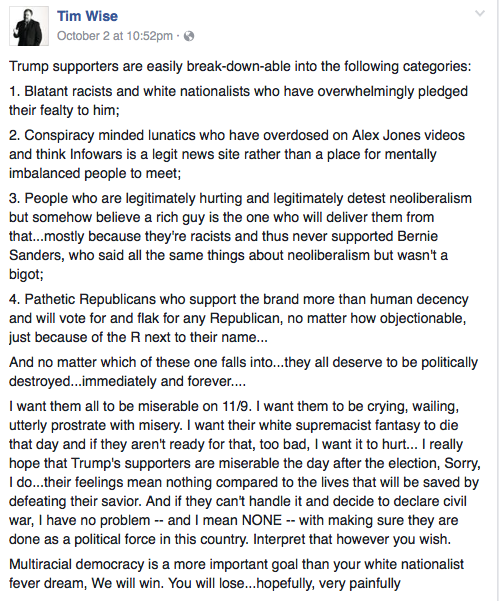 Wise said if the US falls into a civil war after the election because Hillary Clinton won, "I have no problem -- and I mean NONE -- with making sure they are done as a political force in this country. Interpret that however you wish." 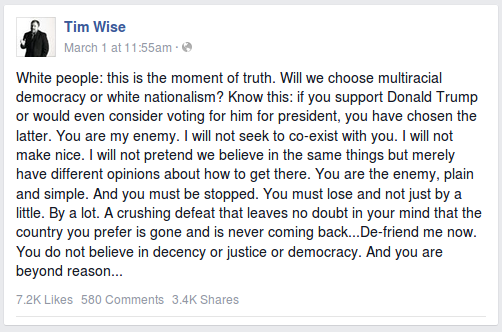 "You will lose...hopefully, very painfully," Wise added. 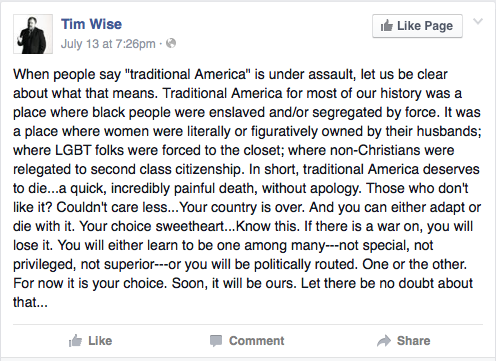 "[T]raditional America deserves to die... a quick, incredibly painful death, without apology," Wise said in another post. This is the face of the "anti-racist" movement in America. Frankly, I'm just surprised he hasn't already been hired to be part of the the New York Times Editorial Board!